Christmas and New Years are over, and so is my blog-break. I hope you all had a wonderful time celebrating the holidays and ringing in the new year! I had a calm Christmas with my family and LOTS of food! But now we're back to normal, and since it's Friday, here comes another Fabergé object - a rare jewelled gold fan! It was made by workmaster Henrik Wigström, around the year 1910. 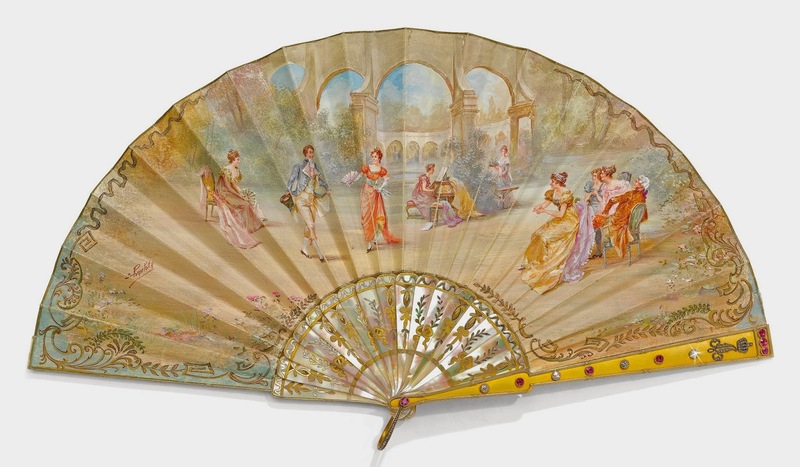 The fan is beautifully painted with dancing figures in early 19th century clothes and signed Charlott. The sticks holding up the painted leaf are made of pierced and gilded mother-of-pearl. The two guards are of matte finish gold with ribbon-tied reed borders. One of them is applied with collet-set brilliant-cut diamonds and rubies, and the rose-cut diamond-set crowned cipher of Crown Princess (later Queen) Alexandrine of Denmark. The other guard is set with diamonds and sapphires. The length of the fan is 8.5'' (21.7 cm). Now that is a fan!!! It is beautiful - but when I realised it had real diamonds on it I decided it's time I was ridiculously wealthy....if only!